In acest topic vom prezenta si discuta despre dispozitivele din categoria Air Mouse. Livrarea cam la 25 zile (din China), a mers din prima in K1 si A4, merge si in televizorul Vestel. Seamana cu telecomanda Air de la LG doar ca e mai mica. Pana acum se comporta bine. 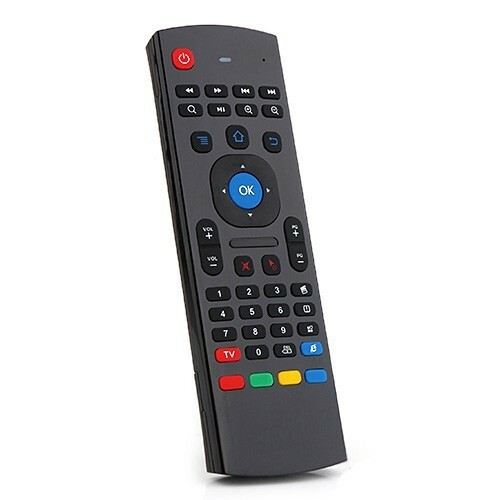 o folosesc pe un raspberry cu openelec, merge brici, cu baterii...luata cu 10� de la aliexpress, cm 2 saptamani a durat..
o folosesc pe un android stick cu kodi, bagat direct in tv, si alimentat din usb-ul tv-ului, foarte eficient, se preste odata cu tv-ul.. ...luata tot de acolo cu 10�...cu acumulator (li-io) o incarc odata la luna...merge brici. Nu reusesc sa fac telecomanda sa mearga cu senzorii. Ma gandeam ca rotesc telecomanda si masina coteste, ca pe telefon. Pot juca Asphalt numai din butoanele telecomenzii. Trebuie instalat ceva ca sa vada telecomanda ca pe un controller ? Fii mai explicit, nu inteleg ce vrei sa spui. Am văzut pe yt că unele telecomenzi sunt capabile să vireze stanga sau dreapta in joc la fel ca telefonul. Mă gandeam că avand giroscop e capabilă și asta de așa ceva. Doar daca are soft special de Android si ai instalat aplicatia de la Google pentru controlere de jocuri. Cred ca stii tu mai bine ca mine care . Am cumparat si eu o "clona" de MX3- L 3, era la "solduri" la Auchan cu 40 lei. Nu are microfon si nici tastatura luminata, instructiunile de utilizare sunt total aiurea asa ca in prima faza am crezut ca e stricata si am verificat electronica din ea, nu reuseam sa o invat comenzi de tv. Dupa ce am cautat pe net am gasit mai multe instructiuni asa ca am pus-o in functiune. Merge foarte bine cu Samsungul Q6, si partea de tv si cea de smart. 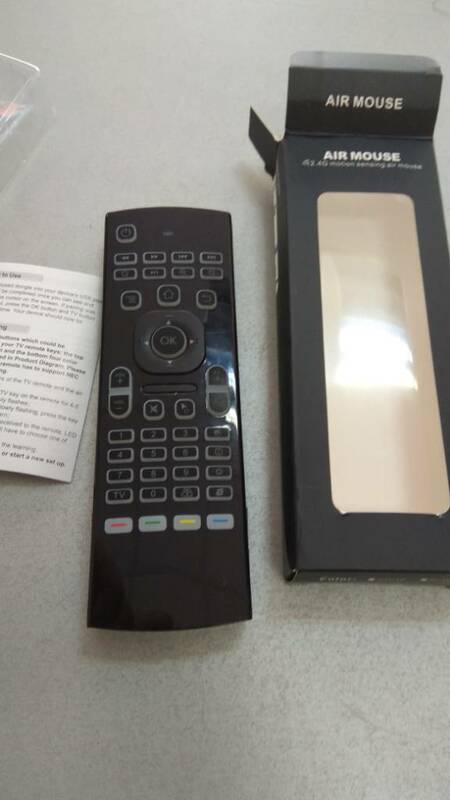 1) Get your standard android remote (or any remote that you want to replicate a button from) and place it end-to-end with the MX3 so that the IR receivers are facing each other. 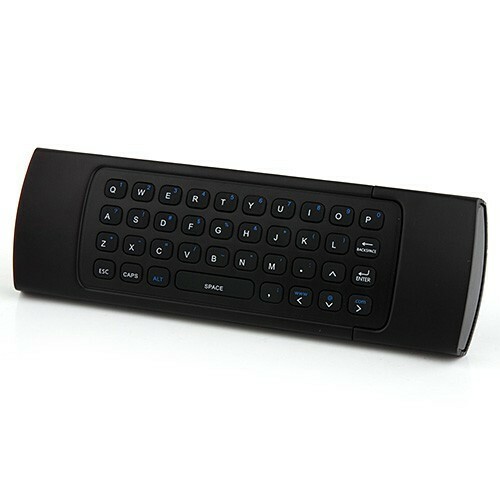 2) Then, on the MX3 press and hold the red TV button. 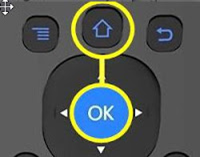 4) Release the �TV� button. 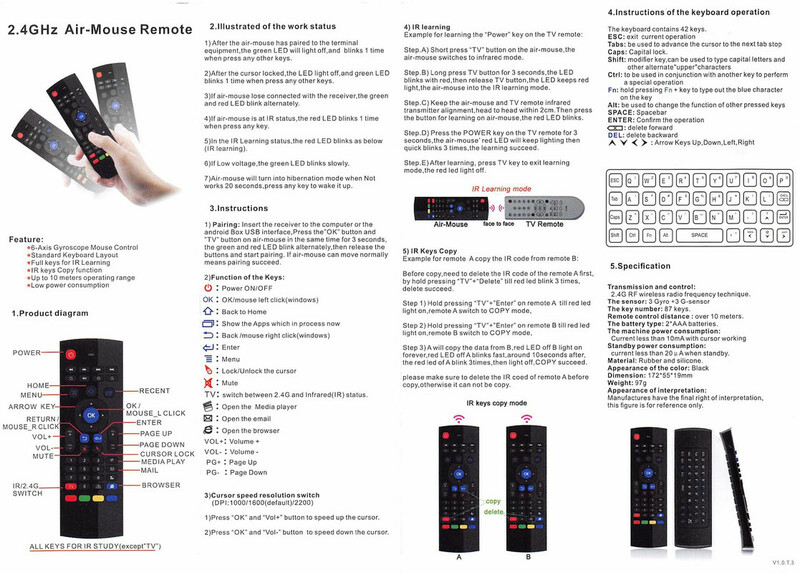 5) Now press the power button on the standard remote (or whichever button you want to map) You will see the LED light stop flashing and glow continuously, at this point press the power button on your MX3 remote. The LED will then flash again and eventually extinguish. 1. A very common issue reported is the air mouse pointer drifting away by itself on screen. 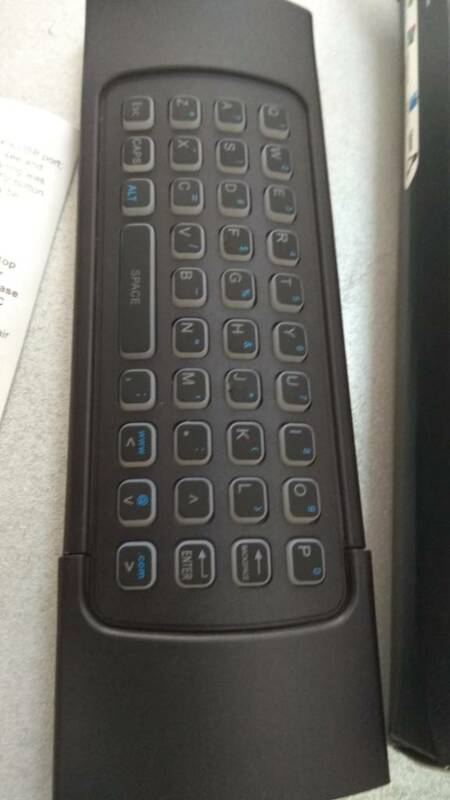 This is just due to a badly calibrated gyroscope...and apparently, none of "brand" selling this remote thought useful to document the simple calibration method available. This is by far the most important omission which lead many users to think they had a faulty device. Keep HOME + OK buttons pressed (as shown in the picture above) until the top LED starts blinking. When it turns off, the calibration is complete. Try the mouse cursor again: it should now stay still. 2. Another undocumented tip: the hibernation mode can be disabled if you find it annoying by pressing the "Cursor Lock" button for 3 seconds. 3. Finally, the instructions could also have included a note like this one: It is normal to not see any cursor on screen even if the pairing was successful. You need to press the Cursor Lock button first. That it is done by holding "TV" button and "DEL" fro a few second until the LED blinks.